In celebration of the Panama Papers leak, Splinter Cell: Chaos Theory developers Clint Hocking and Mathieu Bérubé decided to have a playthrough of its Panama bank level. You may have heard of Hocking after his work at Valve as well as on Far Cry 2, while Bérubé was a game designer at Digital Extremes on the likes of multiplayer for Bioshock 2 and The Darkness 2. Both worked on Chaos Theory towards the start of their careers and have a number of insights to offer in this 50 minute LP. 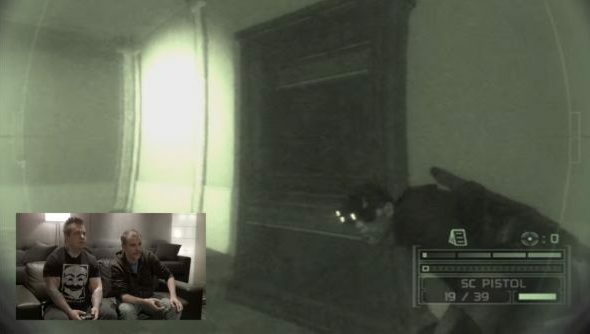 You may remember Splinter Cell as one of the best co-op games ever. Sadly no mention of what they’re getting up to over at Ubisoft Toronto currently, but plenty of chat on what Hocking calls the best Splinter Cell level ever, designed by Bérubé. I love this sort of stuff. Nobody has the insight into the design of a game like the people that did it, obviously, but frankly a lot of us don’t even realise the processes required. The stuff about optimisation of asset loads isn’t the most fascinating thing in itself, but it’s not what we players are ever going to think about. In a blog post on the matter, Hocking goes a bit more in-depth about the Panama Papers fiasco itself and what he thinks about it (spoilers, he’s not a fan of people and corporations not paying tax). He also makes it very, very clear that two members of Ubi Toronto doing a Let’s Play of a classic Splinter Cell game is in no way an indication of what they’re working on. I’ll leave it to you to debate why he felt the need to give such a forceful qualifier. Here’s the blog entry for closer analysis.